A BBC Childrens Classic.... It's timeless! 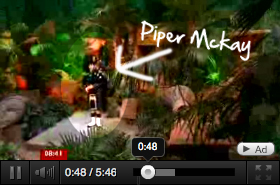 The BBC asked Piper Mckay to record ZingZillas and feature as the Bagpiper, representing the Bagpipe instrument to the World, Piper Mckay thought it was a very important responsibility. 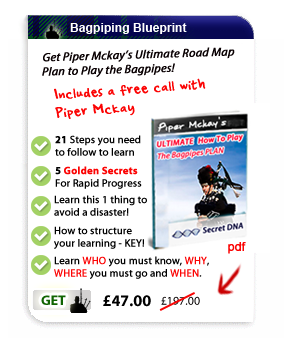 Speaking recently about ZingZillas Piper Mckay commented..
"I'm thrilled to share with children across the World the Magic of the Scottish Highland Bagpipes. Zingzillas has taken the World by Storm, every child has the ZingZillas Bug!.. Music is one language, getting children involved during their important developing years is so important to me. It's all about having Great Fun!" This BBC Worldwide timeless classic is a perfect show for children. Kids from across the planet are rocking to the ZingZillas! Learning to embrace music from watching and learning along the way.... Happening Now! This show is a ground breaking classic, it has a great positive fun and musical educational influence. "ZingZillas: The Album" was released on CD and as a digital download, reaching #1 in the iTunes Children's Chart on the first day. 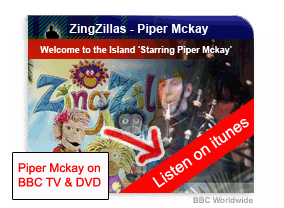 Listen to Piper Mckay on ZingZillas - The Album. ZingZillas is a stunning high quality Worldwide musical show produced in house by the BBC. It is shown on CBeebies and distributed on dvd and Worldwide TV channels. The 52 x 22 minute show produced at Pinewood studios is set to get pre-schoolers across the world rocking, jumping and jiving to a new beat. ZingZillas is a Ultra High Quality production introducing the musical instruments of the World to children from all walks of life! Piper Mckay features and plays on 'Aunty Dot's Dash' episode. Piper Mckay plays the Audio Track No.2 on this High Quality Album. This landmark music show is set on a tropical island where everyone joins in to create ZingZilla music magic. With influences spanning the globe from rock to soul, jazz to samba, big band to orchestra, ZingZillas will get its young viewers jumping, swaying and trilling to music from the world over.